Hey, why not do something big for the 20th Awesome Turtle Picture? Okay, sure. How about we try and figure out just how many times that iconic rooftop pose of all four Turtles from TMNT Vol. 1 #1 has been done and redone? 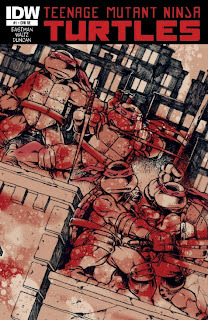 Special thanks to Discordiatookie, Powder, Adam Winters and Matches Malone of The Technodrome Forums for helpin' me out! 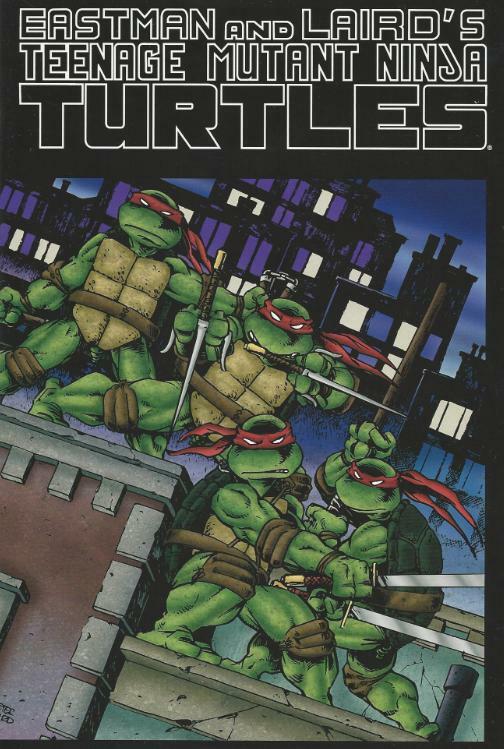 And here's the first "real" use of that image, as the cover for Mirage's TMNT Vol. 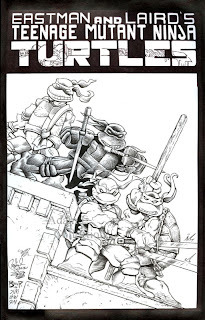 1 #1 by, of course, Kevin Eastman and Peter Laird. 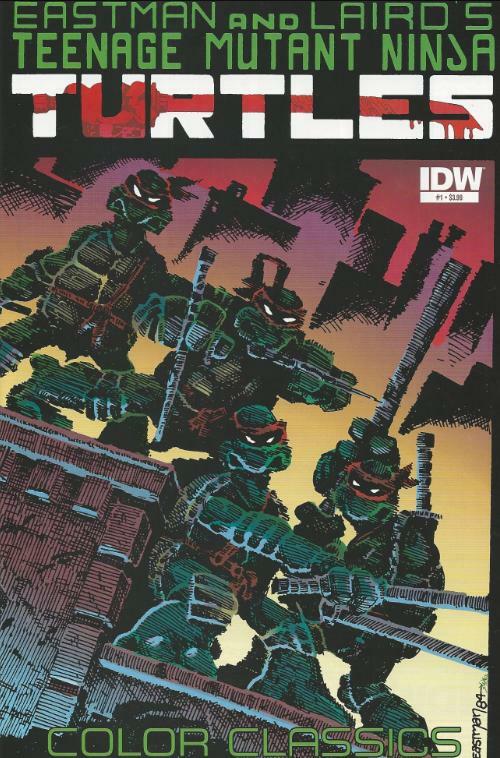 Just for note, many reprints of the issue (such as the 2nd printing and the Free Comic Book Day 2009 edition) used the original cover without any alterations. I'm only listing versions of the image that were in some way modified or unique. Mirage would get quite a bit of life out of this single image. 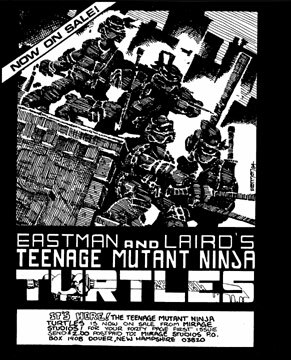 First, it was re-traced, re-inked and fully colored by Eastman and Laird as an iron-on for t-shirts (one of their very first forays into the world of TMNT merchandising, in fact). 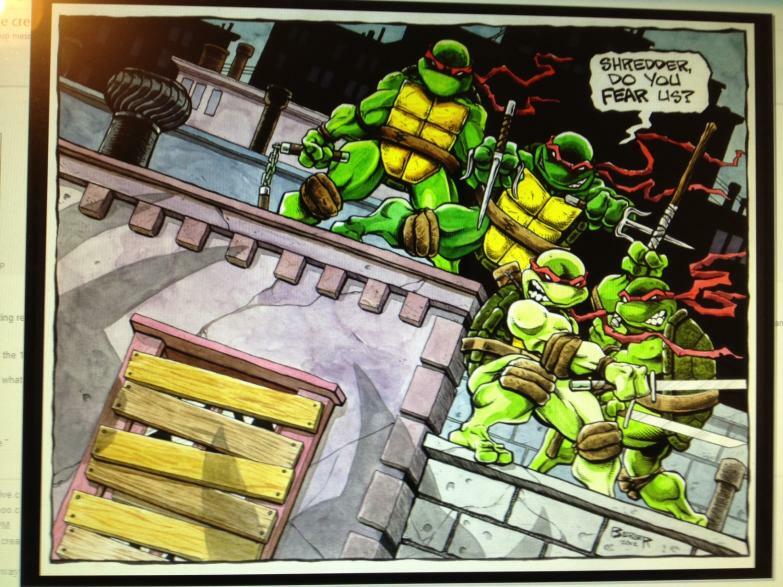 Now, here it is colorized by Scorpion Studios in 2012 for IDW's TMNT Color Classics #1 reprint. 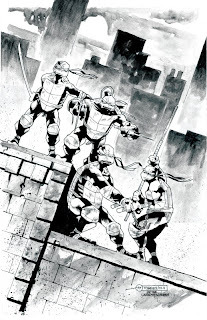 For the big anniversary issue, TMNT Vol. 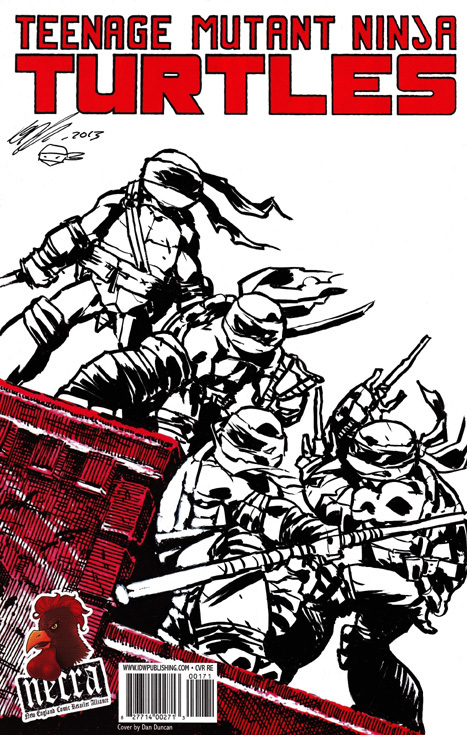 1 #50, Eastman and Laird reunited on art duties and recreated the cover wholesale for the very first time. This rendition of the cover would be touched-up and reused more times than the original, if you're counting variations and not just straight copies. 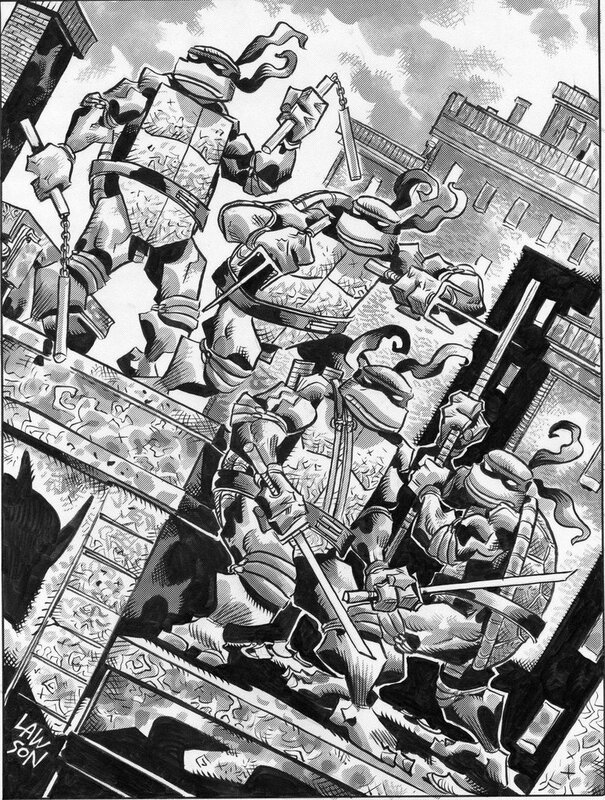 Here it is, reduced to original black and whites by Peter Laird for the 2005 PBBZ reprint of TMNT #1. 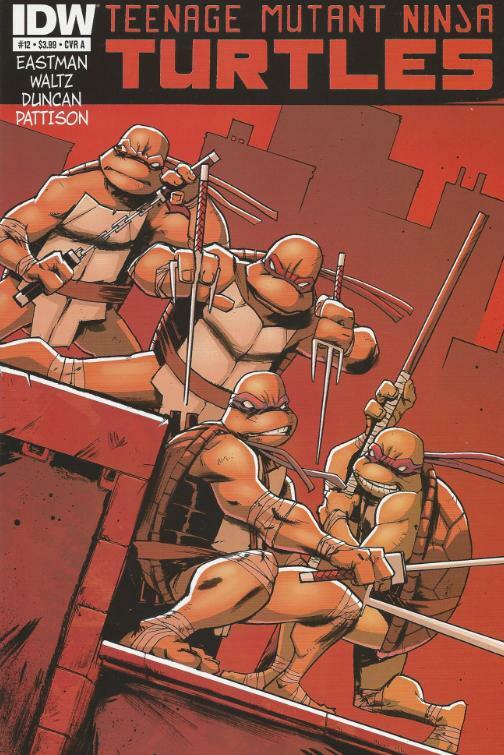 Here it is again in 2009, re-colored by Steve Lavigne for a new color edition of TMNT #1. 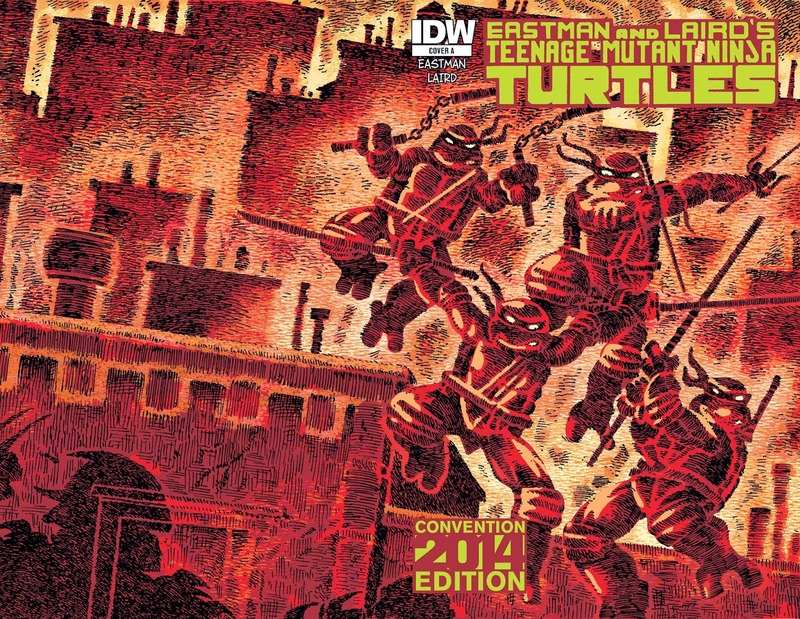 IDW would have their fun with the image, giving it a red/orange smattering for their Jetpack Comics exclusive variant of TMNT (IDW) #1. 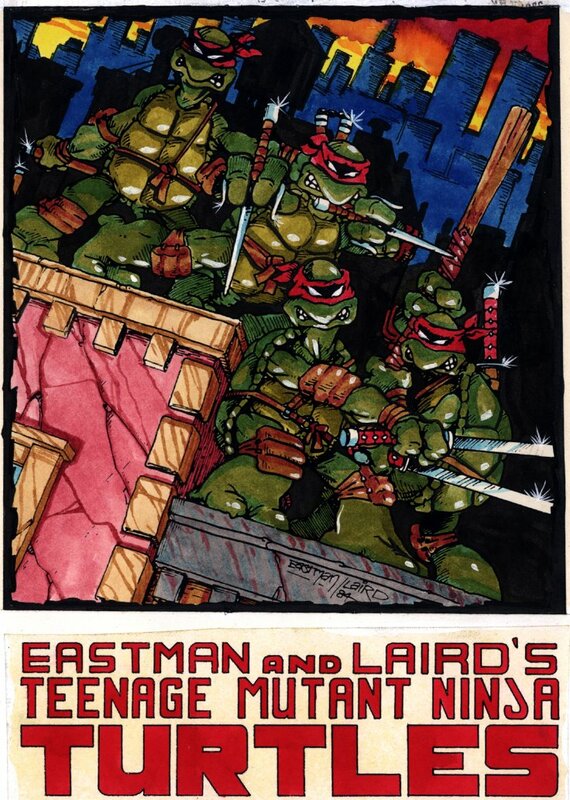 But Eastman and Laird aren't the only ones who can have fun with the iconic rooftop image. 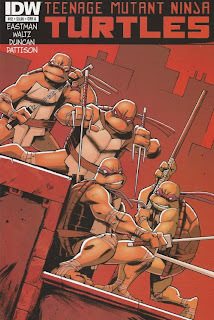 Frank Fosco did an homage to it for the cover of the TMNT Vol. 3 trade paperback published by Image Comics (weren't the '90s hilarious?). 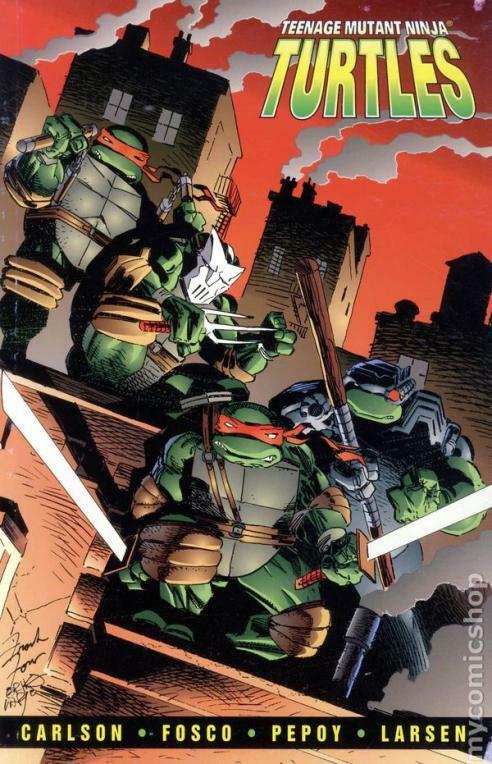 As a tie-in to the 2007 "TMNT" feature length animated film from Imagi, Mirage published several prequel comics and a movie adaptation. 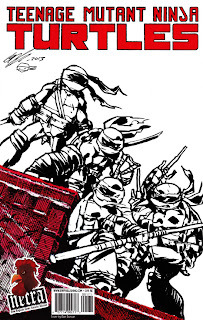 When they were collected, Steve Jung provided this homage for the cover of the trade paperback. 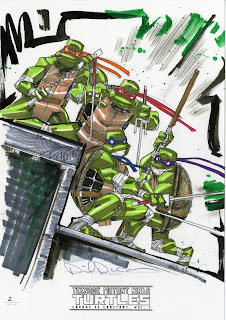 In 2012, Dan Duncan did an homage for his cover to TMNT (IDW) #12 with colors by Ronda Pattison. 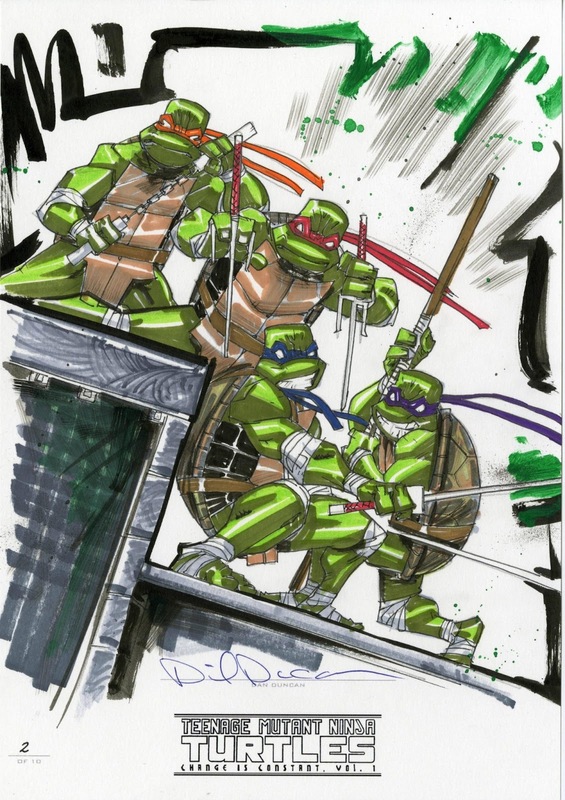 Duncan redid his homage for a limited edition art piece that came packaged with a hardcover collection of IDW issues (also, calm the hell down, Donatello). And here is one of the most unique homages to the image I've ever seen. 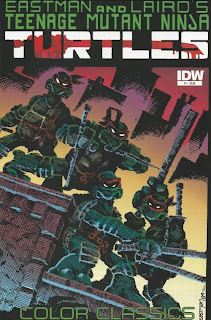 For the 2012 San Diego Comic Con, IDW had this cover for TMNT Special Edition #1 created using modified versions of the Playmates Teenage Mutant Ninja Turtles action figures from the Nickelodeon series. 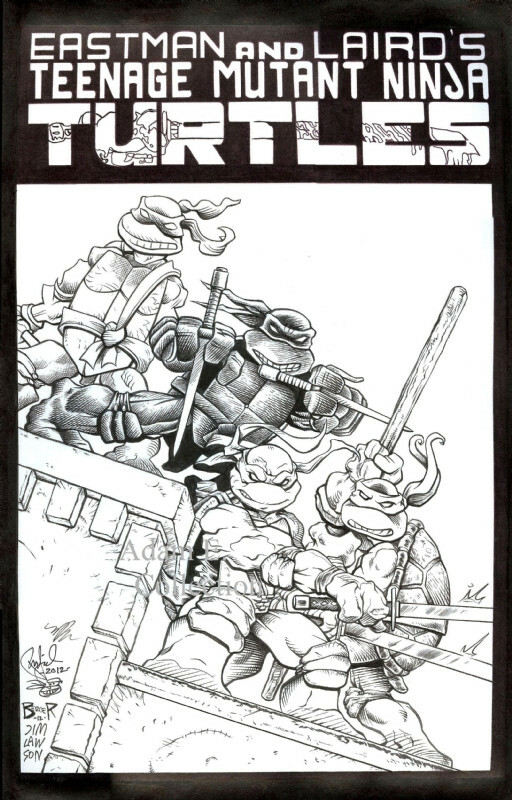 For the 2014 San Diego Comic Con, artist Bryan Turner did this homage for LEGO TMNT #1, IDW's special comic for that convention. One more from the 2014 San Diego Comic Con. 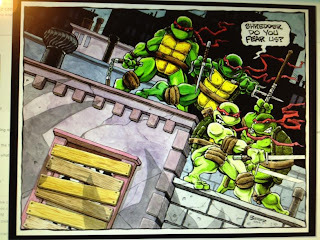 This one's by Kevin Eastman (pencils), Peter Laird (inks) and Ronda Pattison (colors) for a reprint of TMNT Volume 1 #1. Basically, it's 1 second after the original cover and it's pretty cool. The cartoons aren't exempt from getting in on the act, either! 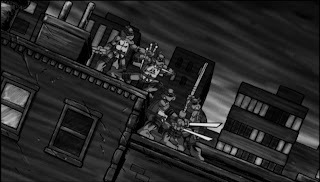 While the Fred Wolf TMNT can be seen prominently standing on a rooftop in their title sequence, alas, it wasn't in homage to the iconic pose. The 4Kids incarnation of the Turtles never did it either. 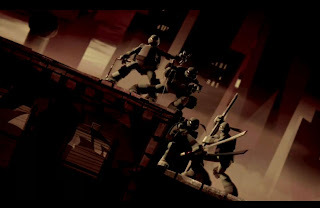 However, for the 2009 film "Turtles Forever", when the Fred Wolf and 4Kids TMNT visit Turtle Prime, they encounter the Mirage TMNT. Before the film ends, the Mirage TMNT strike the familiar pose. The new Nickelodeon TMNT cartoon wasted no time in supplying an homage for the classic cover. They do it every episode in the title sequence. 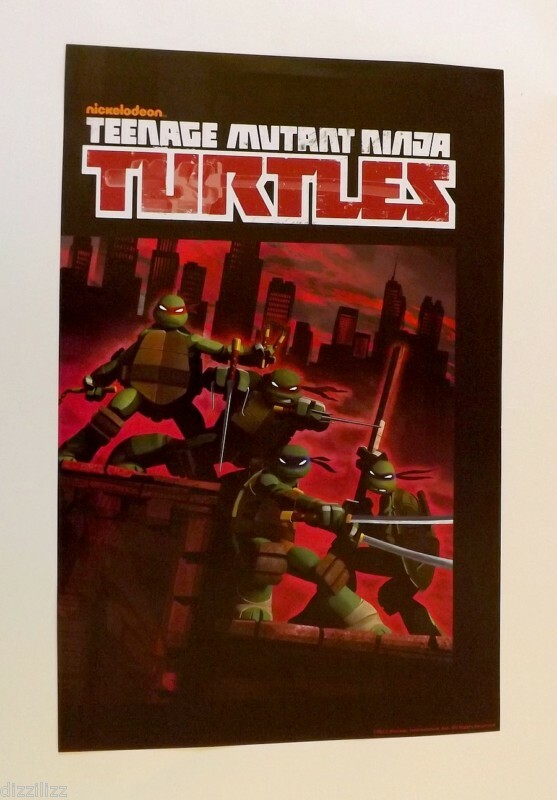 The pose was also used for a promotional poster to the Nick cartoon, distributed at the 2012 San Diego Comic Con. But we're not through just yet! Many, many TMNT artists over the years have drawn homages to the classic image, but not always for reprint covers. Some have done it as prints, on their own time or as commission art for fans. Here's one by Mirage Staffer Dan Berger. Here's one by James Silvani (who created official TMNT merchandising artwork for Mirage over the years). By the way, his Darkwing Duck comics were awesome. Here's an epic one from Mirage's Number One Go-To Guy, Jim Lawson. This one is by Mark Torres, artist for IDW's Infestation 2: TMNT miniseries. 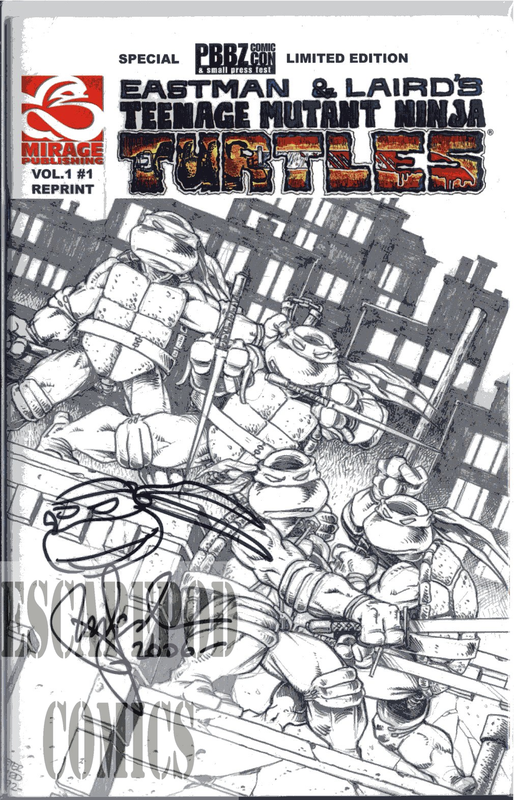 This one was sketched on the blank cover version of a copy of TMNT (IDW) #1 by IDW Turtle artist Ross Campbell (who really needs to draw more TMNT for them). Here's a unique one you can't take home with you. 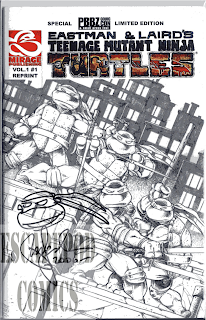 In 2011, Kevin Eastman and Mark Bode' (a guest artist during TMNT Vol. 1) got together and painted this mural for Meltdown Comics in L.A.
And lastly, we have a little something from everybody. 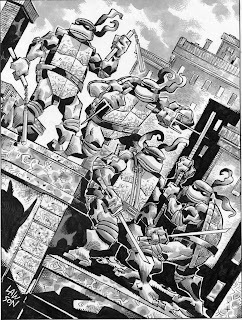 This homage was a jam session by Mirage artists Jim Lawson (Michelangelo), Kevin Eastman (Raphael), Michael Dooney (Leonardo), Peter Laird (Donatello) and Dan Berger (inks). 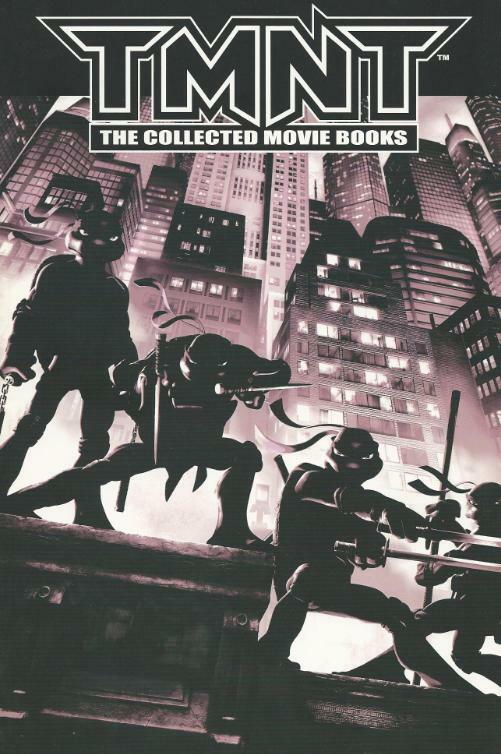 And I bet in all the years you've been staring at that cover in all its many shapes and forms... you're probably just NOW noticing that Donatello has a sword strapped to his back. Weird. Wow. The ONLY homage I knew from this list was the Nicktoons intro. 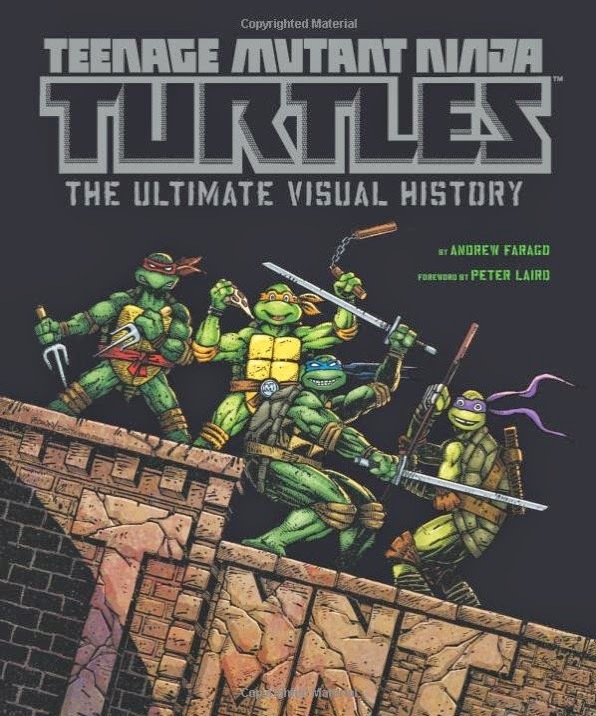 I had no idea this image rivaled Amazing Fantasy 15 in terms of homages. Holy crap! He does have a sword on his back! HOW HAVE I NEVER NOTICED THIS?! Jesus how did I never see the sword? So there's one you missed and I was a little disappoint because I've been trying to find out where it comes from. 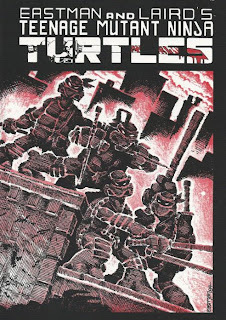 I've wanted a t-shirt with the issue one image for YEARS, and I thought I found one at HMV, it looked right -- right logo, right colouring (monochrome red) BUT it was clearly redrawn by a different artist. 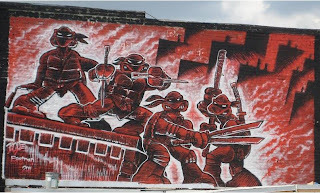 Almost exact but the TMNT had very prominent beaks, kinda like in Soul's Winter. I have no clue where it's from or who did it and dying to know because the doubt prevented me from buying it! Any leads, Mein Kapitan? Don't remember if I'd ever seen Ross Campbell's homage before. 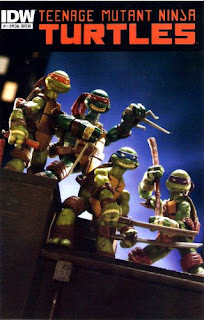 It's cool how he has all the turtles switch places yet still retain their classic poses. I'm a big fan of James Silvani's work on the Boom Darkwing Duck comics. 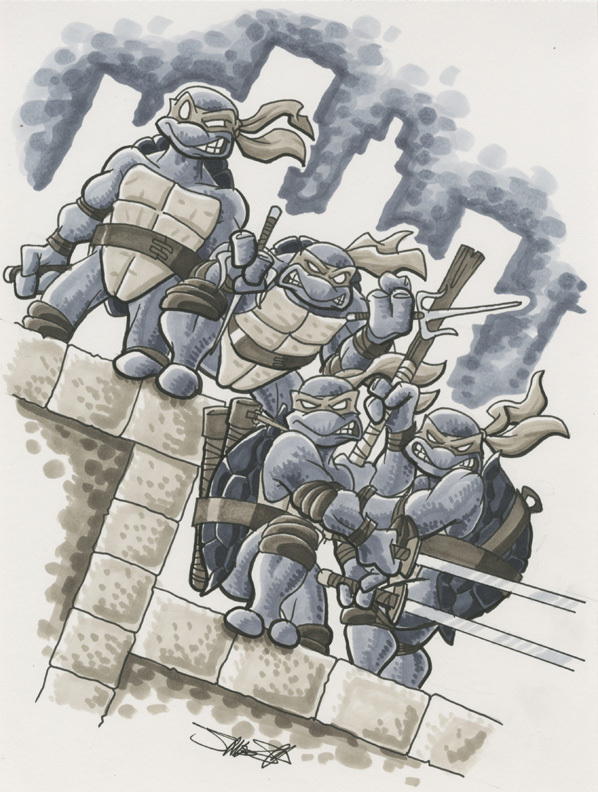 I had forgotten he did a few official TMNT pieces. Do you have the links to those? I just googled it, maybe you saw this one? But I think it would be worth showing the full original Eastman art where the entire Shredder shadow is visible. @Ioannes: Yeah! That's totally it! I dunno, seems official given that it's showing up on official merchandise. 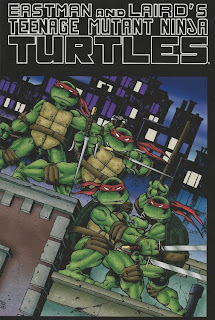 Heh, I forgot about the Shredder shadow being right there on the back cover since the beginning. What I mean is it wasn't done by an official TMNT artist, I don't really know about official merchandise. 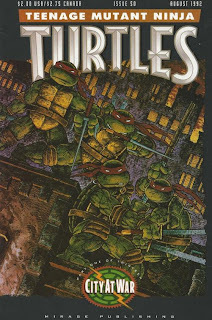 I think there are tons of comic books, books and even album covers that lose a lot of detail because of the wraparound. For me this is one of the very few reasons a physical copy of something is cooler than a digital one. Great write-up, there's a few here I've never seen before! Great to see all of these covers in one place. 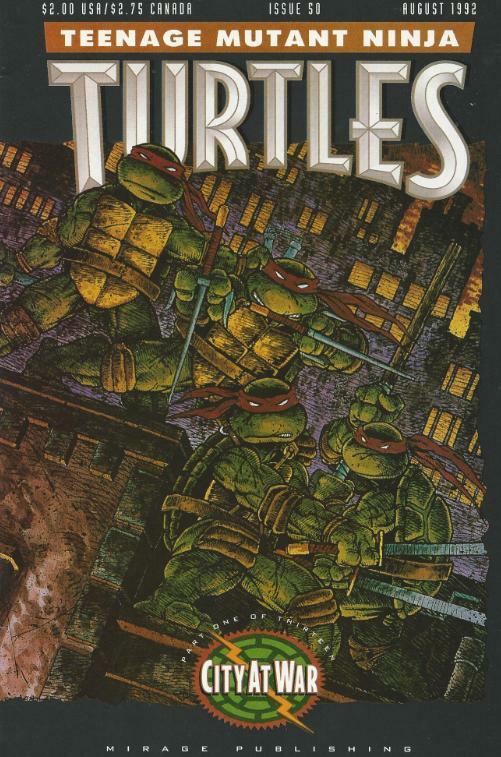 One of the earliest (and modified) uses of the cover was an ad for the 1st issue from Comics Buyer's Guide 547. I can send over a scan to add here if interested. turtlefan2014 at gmail. 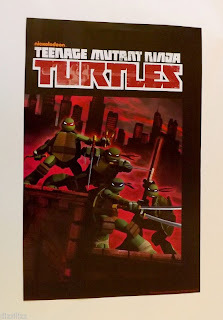 I've added pics and info to my blog site for the Comics Buyer's Guide 547 and others. Check it out. They did a kind of half assy recreation of this for the 2014 movie. (Just spent 30 minutes looking for a link to no avail... but it's out there.